AN AUDIT of the Indian Council of Forestry Research and Education (ICFRE) by the Comptroller and Auditor General (CAG) of India has shown that an “assembly of Indian Forest Service (IFS) officers” has been arbitrarily running the council for personal benefits, sidelining the interests of scientists and researchers. The audit memo, prepared in the first week of April by CAG’s principal director of audit for scientific departments, says over 100 IFS officers are occupying top posts, including those pertaining to research for which they have no experience, and drawing salaries more than what is prescribed. It says many IFS officers continue to hold posts on deputation even after the end of their deputation period and the number of sanctioned post of scientists has been arbitrarily reduced. Promotions and salary upgrades of scientists and technical staff are also being withheld.“Scientific and research activities were made to remain standstill” at the council, says the memo. ICFRE was converted into an autonomous body in 1991 under the Societies Registration Act of 1860 to undertake “holistic development of forest research and education”. It was identified as one of the premier research bodies of the country, similar to the Council of Scientific and Industrial Research (CSIR) and the Indian Council of Agricultural Research (ICAR). The Cabinet, in 1991, decided to reorganise the council on the lines of ICAR to make it flexible and to allow quick decisions. However the Union Ministry of Environment and Forests (MoEF) has not framed rules to work out the functioning of ICFRE on the lines of ICAR. Various bodies, such as the Planning Commission, National Forest Commission and Parliamentary Standing Committee on Environment and Forests, have also made recommendations to this effect in the past 23 years. The CAG memo indicates that the ICFRE administration in MoEF, under the control of IFS officials, has deliberately not taken steps to run it on the lines of ICAR because the present set-up allows them to use the council as per their will. “It was...presumed in audit that such attempt was not made simply due to the reason lest it should stop free and frequent deputation opportunities for IFS officers who presently seem to have gone astray from their mandated and primary objectives of protection, conservation of forest and maintaining ecological environment and rushing towards research fields,” says the memo. Unlike ICAR or CSIR, where top positions are occupied by scientists recruited by an independent board after a standard process, the top posts in ICFRE are held by IFS officers, either through recruitment or deputation. Scientist complain it has been made impossible for them to reach top posts (see ‘Comparison of ICFRE with ICAR and CSIR’ on p10). To this end, ICFRE administration has been making and implementing rules arbitrarily. Consider this. In 1997, ICFRE had a sanctioned strength of 509 scientific staff, 1,029 technical staff and 599 administrative staff. Any change in this composition would have required approval from the Union Ministry of Finance (MoF). But in 2007, ICFRE diverted 10 posts of specialists scientists to the post of deputy conservator of forests (meant for IFS officers) and upgraded them to a higher pay level of conservator of forests without taking approval from MoF, shows the audit memo. In December last year, the council created 59 posts of deputy conservator/conservator of forests, opened the entry of foresters to all categories of staff not available to them initially and raised their pay scales by one level. It also reduced the sanctioned strength of scientists from 509 to 280 and restricted the entry of scientific cadre to higher posts. All this was done without the approval of MoF, says the memo. Flouting the orders of the Supreme Court, high courts and its own board of governors, the ICFRE administration, withheld promotion benefits to scientists, says the audit memo. ICFRE also denied research officers, who were graduates in engineering or masters in science, the pay grade prescribed for them. It spent close to Rs 80 lakh between 2010 and 2013 on service-related legal cases against scientists and research staff. The fee paid to legal counsels was much more than that prescribed by the government, says the memo. “The posts of IFS officers are upgraded arbitrarily and promotions of scientists are withheld so that the forest officials don’t have to work under scientists. In the past 10 years, the criteria for selection of Director General (DG) has been revised at least eight times to ensure scientists do not even reach close to this post. No other scientific organisation has different sets of criteria for the post of DG,” says a scientist working with a research institute affiliated to MoEF. Of top 27 posts in ICFRE and its affiliated research institutes, 24 are currently held by IFS officers. Management ICAR: Managed by the Department of Agriculture Research and Education (DARE) through director general (DG) of ICAR who acts as the secretary of DARE. IFS officers appear to be getting several other benefits as well. The memo says there is no sanctioned post of secretary in ICFRE, but an IFS officer has been posted as the council’s secretary. As per orders of the Centre’s Department of Personnel and Training, no official can retain a position on deputation beyond five years without the department’s approval. But the audit has found cases where foresters, including the secretary of ICFRE, have been continuing on posts for up to seven years. Denying the charges, Sudhanshu Gupta, secretary of ICFRE, says: “Selections to higher posts are done by a search committee of MoEF. It is a prerogative of MoEF to appoint the candidates they find suitable.” He also maintained that the number of posts of scientists has not been reduced since 2000 and that the MoEF guidelines allow IFS officials to stay on deputation for up to seven years. On the allegations that ICFRE, through its secretary, has been flouting court orders on the date of promotion of scientists, Gupta said the administration has been only following MoEF orders and as the matter was subjudice he could not comment further. In another case, the audit memo has highlighted that an IFS officer of the rank of chief conservator of forests, who had joined ICFRE in January last year on deputation for three years, has been sent on training abroad for two years. This has been done under centrally sponsored schemes (CSS), although CSS funding is not allocated for use by ICFRE, says the memo. “The officer is still drawing special pay without actual performance of duties. Allowing foreign training for such a long period to a deputationist shows high level favouritism at public cost,” the memo says. “No action has ever been taken against the wrongdoings in ICFRE. The board of governors, which approves most of the decisions of ICFRE, has forest officers at its helm. The committees formed to review affairs at ICFRE have also been full of forest officials. Scientists have had little representation,” says a former scientist with ICFRE. When created in 1986, the mandate of ICFRE was to undertake holistic development of forestry research in the country for increasing the forest cover and to meet fuel-wood and timber needs. But the council has faced criticism for not having made any significant contribution. Its research output was questioned by the Parliamentary Standing Committee on Science and Technology, Environment and Forests in 2012. “The MoEF is still struggling to achieve the objective of 33 per cent forest coverage to the total geographical area of the country. Deforestation and degeneration of the forests still continue to be major problems. The committee feels that during the last almost 23 years of its existence, ICFRE should have made significant contribution in conservation of forests and rehabilitation of degraded land and established itself as a premier research institute on the pattern of CSIR, which has made remarkable achievement in scientific and technological development of the country,” stated the committee’s report. A major reason for this, says a scientist working for a research institute affiliated to ICFRE, is that there has been no continuity in the research at ICFRE. “DGs get changed in two to three years. Each one of them gives a different research mandate.” The council has been headless for almost 10 years out of the 23 years of its existence. “Ideally, the process for appointment of a new DG should begin at least six months before the retirement of the existing DG. But every DG wants extension, so the vacancy is never advertised in time. Once, the tenure is over, there is infighting in the ministry to get their person to the post,” says another scientist. Besides, there have been financial problems. 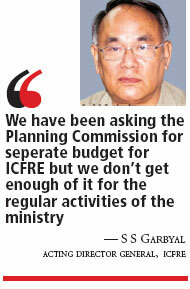 While ICAR has its own budget, earmarked by the Planning Commission ICFRE gets grant-in aid from MoEF. “At least 100 projects proposed by scientists from the council could not take off in last three years because of the shortage of funds. The research is at the mercy of forest officials and MoEF,” says a scientist. For the last 23 years, the fund allotted to ICFRE has always been less than what it demanded. The grant-in aid given to ICFRE in 2012-13 was Rs 110 crore (including the non-plan component) against the total budgetary allocation of over Rs 5,000 crore for ICAR. Of this, about Rs 90 crore are spent on salaries and maintaining the infrastructure. Scientists say at least about Rs 90 crore should be spent every year on research to bring the research standard to a level where it can generate revenue. But the amount spent is Rs 5 crore to Rs 8 crore. A 2006 report by the National Forest Commission said MoEF should allocate at least five per cent revenue from the forests for forestry research. Planning Commission’s Steering Committee on Environment and Forests also recommended augmenting ICFRE’s funding in the 12th Five Year Plan. During a study visit to ICFRE in July 2012, T Subbarami Reddy, member of Parliament and chairperson, Parliamentary Standing Committee on Science and Technology and Environment and Forests, reported that the council was facing a serious financial crunch that could bring its research output to a standstill. “Inter- and intra-services rivalry in MoEF do not allow any policy, administrative and planning decisions on merit. The senior officers in MoEF have no time for ICFRE and forestry institutions are becoming the fiefdom of junior officers,” he adds. The infighting between forest officials and scientists/research cadre has only aggravated the situation. “There is a constant atmosphere of fear among the scientists. 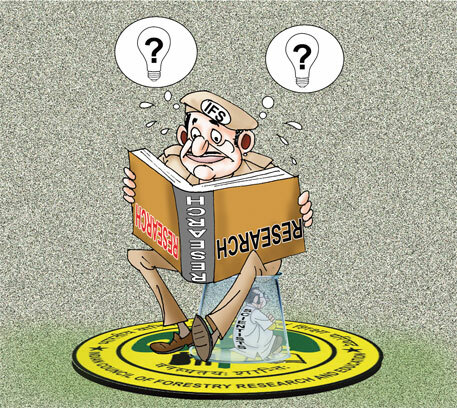 If scientists raise their voices they become victims of administrative roadblocks,” says Hilaluddin, a former scientist with ICFRE who says he was forced to resign because he questioned the functioning of the council. He says there has been so much wrongdoing in the council that people at the top feel if good research is done, the council will come under public scrutiny. The technical cadre at ICFRE has been working on the Fourth Pay Commission salaries. The grade pay of the highest cadre of technical workers is Rs 2,800 which is lower than the pay scale of a driver at ICFRE. Some staff members have been working without a promotion after even 25 years of work. This has been reflected in the audit memo of CAG. “The scientific and other support staff working under ICFRE was found cursing the day on which they consented to join ICFRE... There was complete widespread atmosphere of despair, dejection and depression amongst staff and officers over the autocratic rule of secretary, ICFRE...” says the audit memo. The CAG audit questions whether ICFRE should be allowed to operate in its present form and has sent the memo to the DG of ICFRE and secretary MoEF for “corrective/remedial” actions. “CAG should have waited for our response on the audit memo before asking the DG and secretary MoEF to act on it. Memo is not the final report. We have sent our response to the DG and have requested him to send it to CAG,” says ICFRE secretary. Forest officials across India have a close mind to research and have never encouraged research nor research students into the forests easily. Many ifs and buts are given for granting of permission. Conservation must be based sound scientific principles. If the ICFRE Scientists are not allowed to function due to the bureaucracy of the Forest officials on deputation, how will we get new knowledge in forest protection, how do we expect to increase our forest cover. Countries overseas have gone to great lengths to protect their forests and biodiversity but Indian Forests continue to be managed in the same way as they were since independence. The Forest Officials attitude of "owners of the forests and know it all" has resulted in the present day conflicts with the forest communities. Because Forestry is a pseudo-science, where is the scope for scientific research? The FRI, Dehradun and now the ICFRE there has historically served as a convenient near home posting for the officer and scientist diaspora of UP in general and Gharwal in particular. How so many forest officers and forest scientists belong to Uttarakhand / UP is also an enigma? However, bureaucratic stasis (read RED TAPE) is not the exclusive proprietorship of the IFS. It is in-built into Research Methodology. Government of India should review the functioning of ICFRE and MoEF by appointing a independent committee. The role of MoEF should not be confined to provide the forest and environmental clearance etc. More scientific and technological innovations are required to handle the present situation of the country environment degradation and climate change. MoEF has been spending crores of rupees every year for Ganga Action Plan, Yammuna Action Plan, Elephant project, Tiger project, Biosphere, Mangrove, National Afforestation Programme, Climate Change etc without taking much input from the scientific organisations. The services of scientific organisation should be utilized for improving the environmental degradation. The scientific organisation should be linked with the thrust area of MoEF and GoI and should be allowed to play a greater role and responsibilities independently in the field of Forest and Environmental Science. MoEF is a scientific organisation, therefore scientists in the MoEF should be given greater responsibilities. Down to Earth and Dr. Sunita Narain should sensitize Honorable Modi ji and his government to save the world known organisation in the field of forest and environment science and also save the tax payer money.